My ancestors, Catherine Furst Schwartzmeier Lindemann (born Aschaffenburg, Germany c. 1827), her daughter, Wilhelmina Schwartzmeier Lindemann Goehle (born NYC c 1862), and Wilhelmina's husband, Peter Goehle (born Herrnsheim, Germany 1852) and their extended families lived in the Lower East Side. My grandfather, Frank Goehle, was born at 88 Sheriff Street in 1894. The Germans in New York City were big joiners. 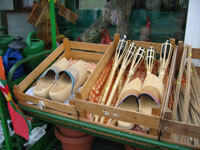 They belonged to a wide variety of organizations which went on outings, held meetings and fairs, gave dinners and balls. Numerous holidays were celebrated throughout the year. From May to October there were outings to Jones's Wood (at 71 on the East River), Elm Park on Staten Island, the Schutzen Park in Union City, N. J., Egg Harbor, N. J. and Hoboken, N. J. The outings began at the hall associated with the organization. The participants paraded through the neighborhood to a Ferry landing that took the group to the designated parklike setting. For instance, the Plattdeutschen Volkvest in 1875 drew 150,000 to Schutzen Park in Union City, New Jersey. It started with a a massive parade from Tompkin's Square Park to the Christopher Street Ferry and a march from the water's edge in New Jersey up the hill to the Schutzen Park. The Germans were great joiners and they loved to sing. There were numerous singing societies in Kleindeutschland. Not only did these groups get together for sängerfest (singing festivals) but they hosted large and elaborate masked balls. As indicated by a story of a singing society member who died in Berlin in 1904 and a 1908 photo of the Brooklyn Arion Singing Society, they also appear to have traveled to Germany together. These singing groups performed the whole range of German composers including Beethoven, Handel, Haydn, Mozart, Strauss and Wagner. The tended not to sing sacred music as that was considered the province of church choirs. There were Liederkranz clubs and halls wherever there was a large German population. The Schiller Bund was a musical society to honor the German poet Frederich Schiller. The Beethoven Maennerchor singing society honored Beethoven. Other singing societies of note were: New York Saengerbunde and Junger Maennerchor. Some regional singing societies who honored there homeland in Germany were: Schwaebisher Saengerbund (Suabian singers), Rheinisher Saegerbund (Rhine singers), Wormatia (Worms) singers. 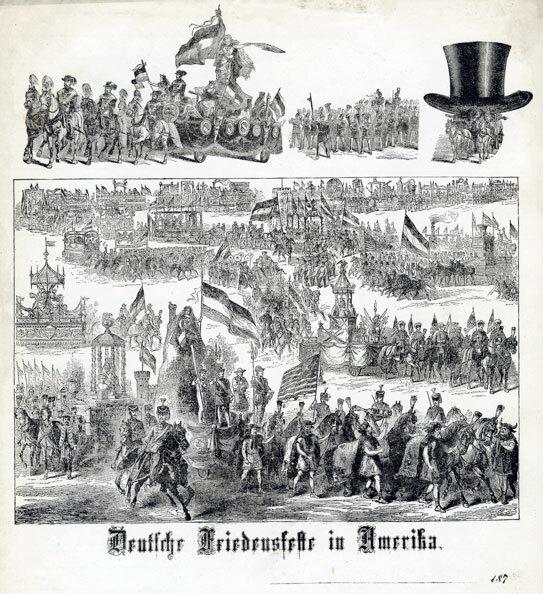 In 1862 25 local German singing societies took part in an event in Jones' Woods: Rheinishe Sangerbund, New York Sing Academie, Uhlandbund, Colonia, Schillerbund, Frohsinn, Social Reformer Liedertafel, Fidelia, Teutonia, Mozart Mannerchor, Germania, Hoboken Quartette Club, Amphion, Sangerrunde, Apollonia, Mozart Verein, Social Reformer Gesang Verein, Concordia Mannerchor, Melomaie, Orpheus, Yorkville Mannerchor, Union Mannerchor, Allemania, Lyra Mannerchor and the Bloomingdale Eintracht. 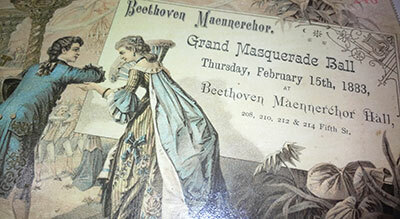 In January 1870 masked balls were given by: The Schillerbund, Abr Schneler, Hansabund, New York Saengerbunde, Junger Mannerchor, Schwaibisher Saegerbund, German Leiderkranz, Uhland Bund, Rheinisher Saegerbund, Beethoven Saegerbund and the Wormatia singing society. Importent members of the German community belonged to multiple organizations. Henry R Caplan born in Danzig Germany in 1854 trained as a jeweler. However, in 1891 he started a liquor business at 67 - 69 St. Mark's Place. He was very successful. 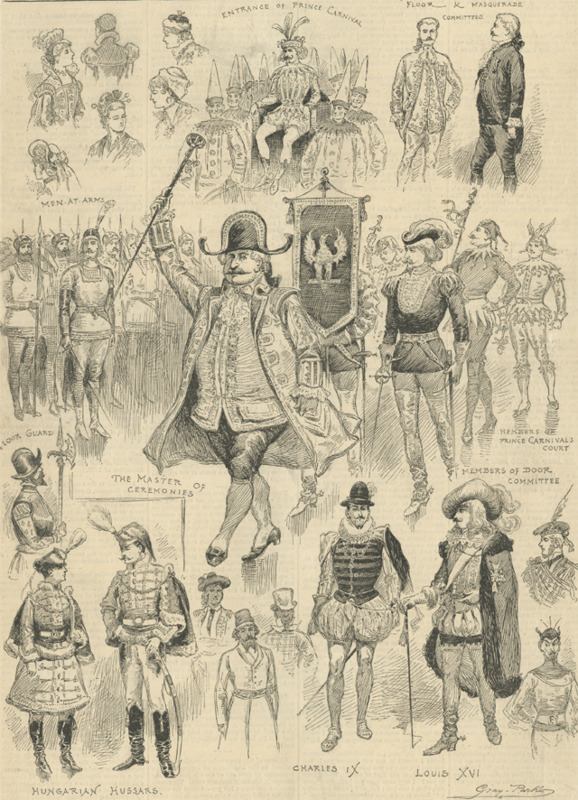 "An index of this is readily found in glancing over a list of the societies to which he belongs, - Odd Fellows, Knights and Ladies of the Golden Star, Knights and Ladies of Honor, New Yorker Schuetzen Corps, New Yorker Schuetzen Gilde, Hessen Volksfest Verein, Kreutzer Quartet Club, Verein Austria, Schlichner Quartet, Rahborner Singing Society, Hamburger Society, Brammed Verein, Mainzer Carnival Verein, Beethoven Maennerchor, Washington Bowling Club, Navahoe Bowling Club, Fraeligarten Lodge, I. O. O. F., Jordan Encampment, I. O. O. F. This is merely a partial list; it could readily be extended, but it is enough to show that Brother Caplan's social sympathies and affiliations extend over a wide area and cover a wide variety of interests. Needless to say that a man with such connections enjoys a very large circle of friends and acquaintances." See What's on the Menu? a 1901 menu for the Danzinger Martini Fest 67-69 St. Mark's Place. 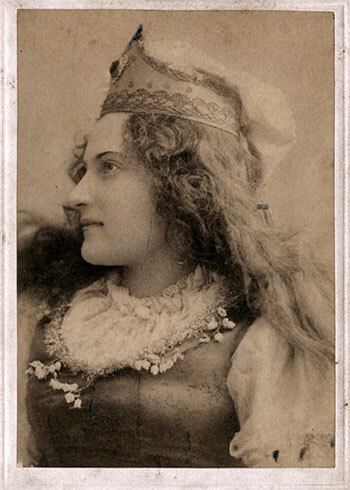 The Liedergranz ball of 1883 was held at the Academy of Music and was their 30th annual ball. A feature of the Liedergranz balls was the grand parade with all of the participants dressed in elaborate costumes. The 1897 Arion Society Dance was held in Madison Square Garden. The celebration opened at 10:30 with a procession of fantastic floats carrying multiple gods and goddesses, nymphs, satyrs, and other figures from mythology, opera and literature. "By 12 o'clock the procession was over, and the masked dancers took possession of the floor" (New York Times, February 12, 1897). The ball lasted till 6 o'clock in the morning. The two great masked balls in New York were the Liederkranz and the Arion balls. For years the Liederkranz Ball was held at the Academy of Music and the Arion Ball was held at Madison Square Garden. The Arion Ball was not only a dance but a major indoor spectacle. Days of preparation were needed to decorate the garden. In 1897 there was "an immense grotto of imitation icicles" and "a mammoth floral star, hanging from the ceiling" which fell apart at midnight releasing "50 imprisoned sparrows" at the same time "a colossal egg" which also hung from the ceiling "let a shower of bouquets fall upon the dancers". In addition there was an abundance of paper streamers and confetti. In 1887 "great festoons of evergreens hung from the centre of the ceiling of the Metropolitan Opera House to the galleries, where they met elaborate decoration of flowers and greens. 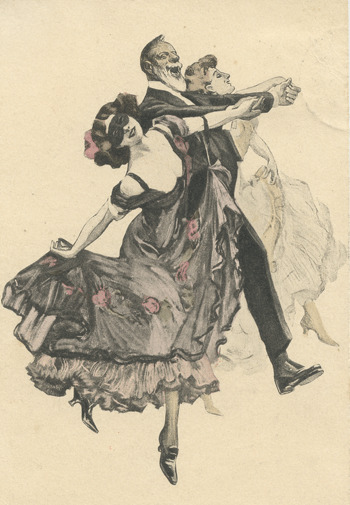 Over the center of the dancing floor hung a huge floral ball of poses pinks and violets." According to The Atlantic monthly, Volume 44, 1897, author unknown, ladies did NOT go to masked balls in the United States, hence all of the women at the Arion Ball were NOT ladies but may have been "a milliner, or a washer woman, or your wife's maid, but not a lady." The New York Times routinely described the balls each year and it is fun reading about the themes of the floats, tableaus and dances. Rumor has it that my grandparents, Frank Goehle and Isabelle Walsh, met at one of theses costume balls. Frank Goehle was of German decent. His father came from Germany in 1873. His mother was born in Kleindeutschland to German parents. Frank grew up in Kleindeutschland. On the other hand, Isabelle Walsh was the daughter of Irish immigrants. In July 2017 Heidi Jordan shared images of several ball tickets which she found in a family scrapbook. Her grandparents were from Germany and lived in Brooklyn. 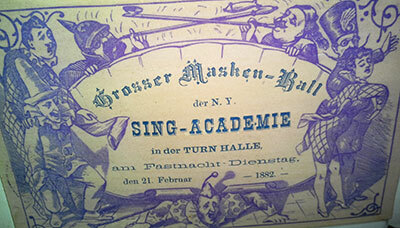 Masken Ball New Yorker Sangerrunde Mondag des 13 Feb 1882 Germania Assembly Rooms 291 & 293 Bowery, N Y. In April 2018 Adam Woodward shared a large number of Lower East Side period images including this ball ticket from 1884. "The Boulevard Club will celebrate at their Club grounds, on the bank of the Hudson, early in the morning. A grand reveille will be beaten, the American flag will be raised, thirteen guns will be fired in honour of the old thirteen states, and the "Star Spangled Banner," and other songs will be sung by the Boulevard Quartet Club, assisted by either musical talent, the members of the Boulevard Club and their guests. At twelve o'clock noon, thirty-seven guns will be fired in honour of the thirty-seven states of the Great American Republic. At three o'clock Professor William M. Jelliffe will recite the "Declaration of Independence." There will be music and songs of the Revolution, and at four o'clock Jerrome Buck will deliver the oration. At five o'clock speeches will be made by some of our most prominent citizens, interspersed with music and recitations of poetry of the Revolution. The entertainment will close with fireworks, bonfires, and illuminations." 1883: Rochester Democrat and Chronicle February 14, 1883 "The Boulevard Club will give their first bal masque at Germania Hall Monday evening April 9th." 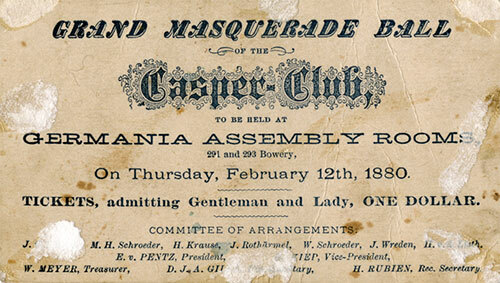 Grand Masquerade Ball of the Casper Club to be held at Germania Assembly Rooms 291 and 293 Bowery, on Thursday, February 12, 1880 Tickets, admitting Gentleman and Lady, one dollar. 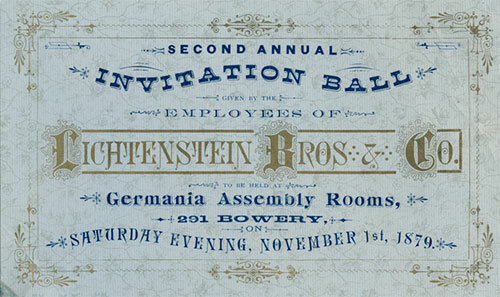 Announcement of the Second Annual Invitational Ball given by the employees of the Lichtenstein & Brothers cigar company November 1, 1879. 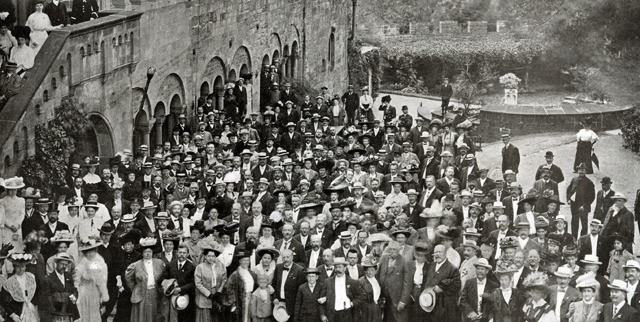 German singing societies hosted singing competitions called Sängerfests. They were held wherever there was a sizable German population. The festival usually lasted three or four days and included torchlit processions in the evening, day time parades, singing competitions, balls and picnics. The processions were accompanied by bands and military marching groups and were festooned with banners and flags. Singing groups arrived from all over the country to compete. The festivities were held in various venues around the city. The participants marched from one place to another and traveled by ferry and other boats to designated parks for a glorious picnic. The first Saengerfest was held in the US in 1849. Their popularity waned during WWI and WWII due to anti German sentiments, but they are still held in areas with large German populations. FIRST DIVISION. A Squad of Police. Ten Mounted Aids with blue scarfs. Festival Marshal, Joseph Hillenbrandt. Music and Drum Corps. The Eleventh Regiment, N.Y.S.N.G., under command of Lieut.-Col. Lux. Battalion of the Ninety-sixth Regiment, N.Y.S.N.G. Drum Corps of the Fifth Regiment, N.Y.S.N.G. Fifth Regiment, N.Y.S.N.G., under Major A. Meyer. Music and Drum Corps of the New-York Turnverein, (fifty men.) Tee Turner Clubs of New-York and Environs, (one thousand men.) Marshal L. Burger and Aids. 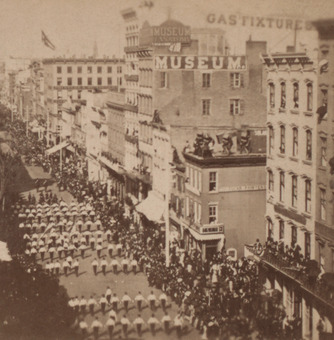 The procession marched down broadway and across the city to the east side where they boarded boats for Jones Woods where 1600 tables were set up. "Mountains of eatables and oceans of drinkables were provided, and waiters to the number of several hundred were employed for the occasion. Flags and banners gaily fluttered from every point, while wreaths of flowers decorated pillar and post." There was music, dancing, and games. 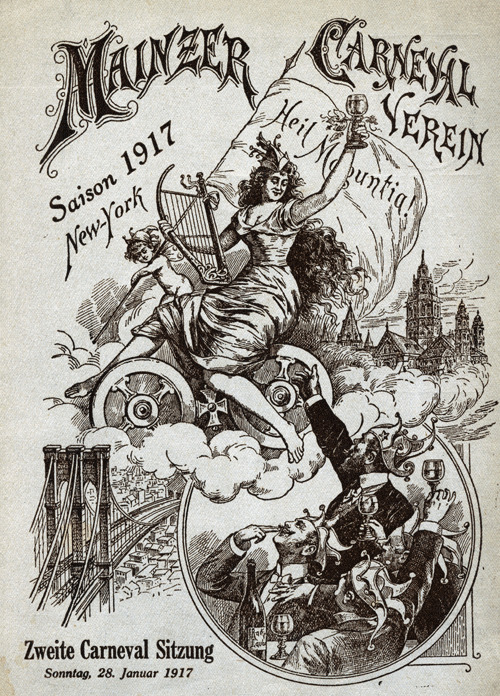 The National Saengerfest was held in New York City in June 1894 and was the first time the city had hosted a Saengerfest in a quarter of a century. The festival was held a Madison Square Garden and consisted of five "entertainments" held between Saturday evening and Monday evening. It was attended by over 50,000 people. At one of the performances 6,000 singers, representing singing societies from all over the country, stood on tiers ranging from the ground to the rafters. They were accompanied by a 150 person orchestra. The various societies competed for prizes on Sunday and Monday afternoons. A picnic at Gravesend Beach, where the prizes were awarded, closed the 1894 festivities. *Washington Hall on Elizabeth Street was a German (lager beer saloon, New York Times, no date) and/or a German Opera house at 103-107 Elizabeth Street near Grand (A history of the New York Stage, 1903, Thomas A Brown). "They came from Philadelphia, from Buffalo, from Pittsburg, from Hartford, from Baltimore, and from many other cities, and devoted the day and night to processions, to concerts, to prize vocal tournaments, to picnics, to sports, to excursions, to jollity. With characteristic geniality the great multitude sang and drank and laughed and played and peacefully departed." The 9th New York Sangerfest took place in July 1865. A parade of six divisions marched through lower Manhattan and past City Hall where the mayor greeted them but did not make a speech. Included in the parade were squads of police, drum and music corps, Military Regiments, Turn Club members, singing clubs from Philadelphia, Baltimore, & other places, numerous New York singing clubs and other New York German societies and bands. There were 34 New York societies and 50 guest societies from other cities. The streets were thronged along the line of march with an interested crowd of all nationalities, who cheered and hurrahed as the procession passed. Entering the east gate of the park, the societies filed past the Mayor, who reviewed them, but made no address; after which, the procession marched down Broadway, across the east side of the city to the river, where they took boats for the festive haunts of JONES' WOOD. Johns Woods was decorated with flags, banner, and wreaths of flowers. The festivities continued with a day long picnic which included dancing a games and lots of lager beer drinking. 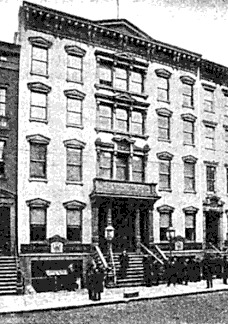 The Brooklyn Arion Singing Society was founded in 1865 with 12 members. In 1894 there were 520 members. By 1894 there were 30 German Singing Societies in Brooklyn! The Eichenkranz singing society held a masked ball on Monday 12 February 1917 at the Terrace Garden Theater. 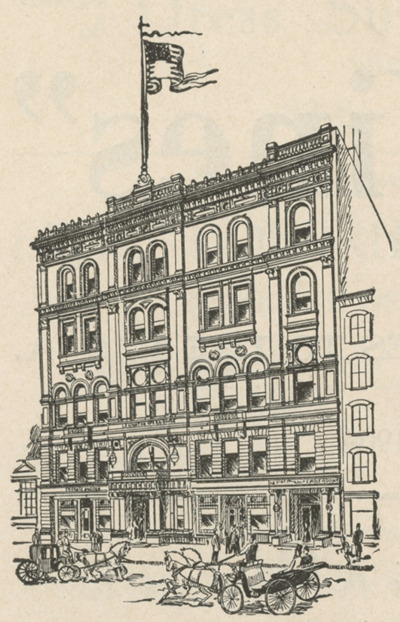 The Terrace Garden Theater (or the Lexington Avenue Opera House) was located between Third and Lexington at 58th Street. Established in 1866 it was in existence until 1925. It was one of the important locations for the performance of German theater and for German social gatherings. Many prominent members of the New York German community belonged to the Eichenkranz. 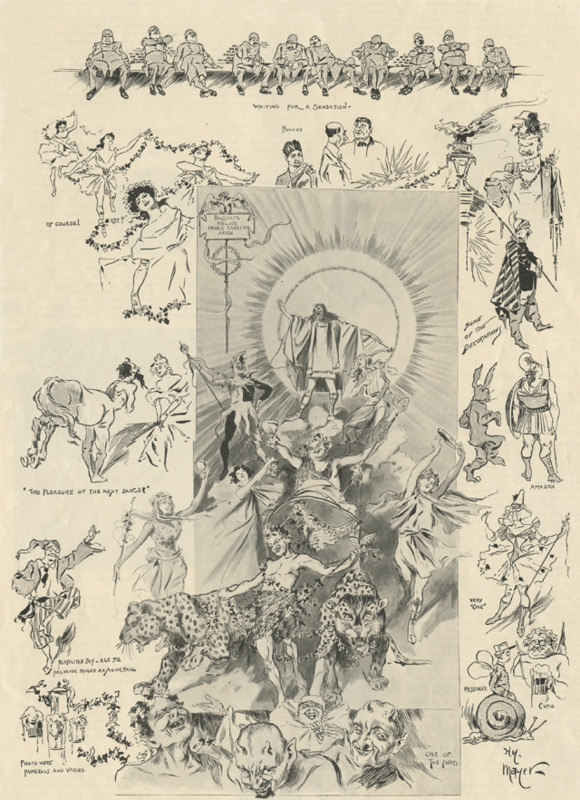 Terrace Garden from Mainzer Carneval program January 1917. The Mainz Carnival is one of the largest carnivals in Germany. 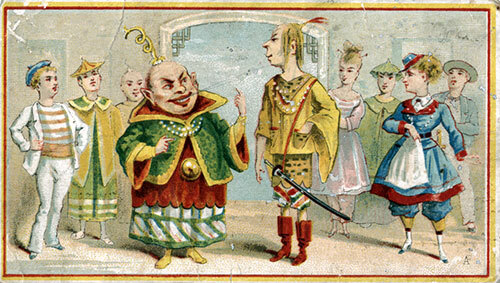 The Mainzer Carnival society was founded in NYC in 1838. It was one of the most humorous and gayest carnivals in New york. 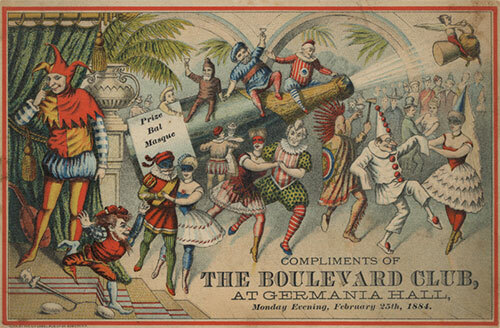 On February 6th 1870 the Mainzer carnival ball was held at the Walhalia. 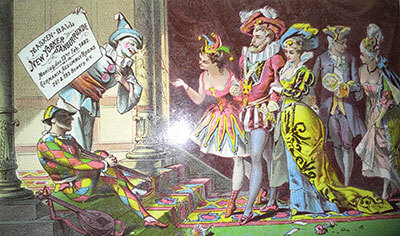 The Prince of the Carnival and Papageno (from Mozart's magic Flute) attended. The entertainment was full of humor and wit. A menagerie of animals all made out of potatoes was the cause of much mirth. See Mainz Carnaval. Family tradition is that my grandparents, Frank Goehle and Isabel Walsh, met at a masked dance circa 1920. 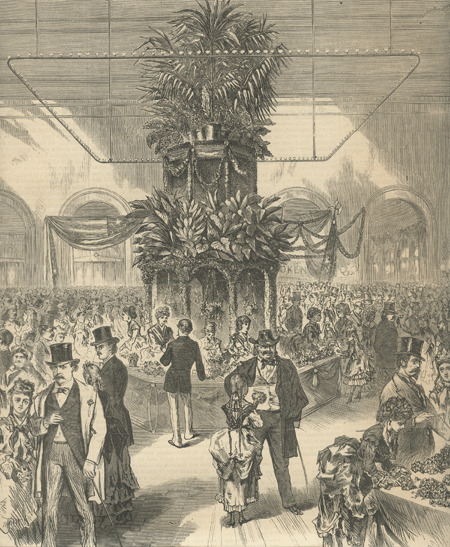 On November 26 1868, Thanksgiving Day, several German balls were held in New York: Bremerode Social Club at the Union Assembly Rooms, The Schwabischer Saengerbund at Walhallia, the Hairdresser's Association at Germania, the Columbia Schuetzen Company at Fortuna Hall, the North River Guard at the Casino on Houston street, The Kuntz Light Guard at the Harmony rooms, the Polyhimnia Society at Dramatic Hall in Houston and several others at uptown venues. 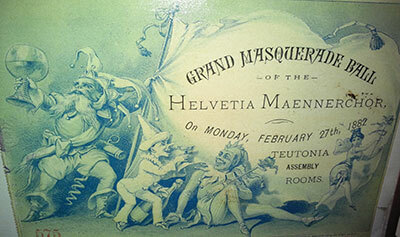 See Meeting Halls In January 1885 some New York chefs gave a masked ball at the Teutonia Halls. One "gentleman" wore a mask with a lobster for the nose, oysters for the ears, a beefsteak for a tongue, a sausage for the underlip, fried eggs for eyes, and lettuce for hair. On February 1, 1888 the Pharmaceutical Graduates Bowling Club gave a "light" ball at Teutonia Hall. It was called a light ball because the ladies wore light colored dresses. Satin was the preferred material. Most ladies wore white satin. Blush pink, corn, ciel blue, cardinal, seal brown and black were also worn. The same night the U. S. Grant Club gave a ball at Webster Hall. Black and white satin were the most common gowns. The misses Timmerman both wore black lace over lavender satin. Mrs. Philip Blauch wore silver satin. Miss Emma Coleman wore terra cotta velvet. Seal brown satin was very popular at this ball. On February 15, 1888 the Aeolian Bowling Circle gave their third annual ball on Ash Wednesday at the Teutonia Hall. No one seems to have minded that Lent had officially begun. A list of some of the attendees and brief descriptions of their ball gowns was published in the Evening World. Black satin was the most popular with either, velvet, jet or lace trimmings. White satin followed. For the most part the gowns were cut low or with a "very deep V". Many were sleeveless with mousquetaires* gloves in satin or lace to the shoulder. Other gowns were white, brown, lavender, steel gray, maiden's blush pink, and floral in satin, pout de soie, silk or velvet. All were trimmed with ribbons, lace, jet, ostrich tips, or braid. A number of the dresses had "overdresses". 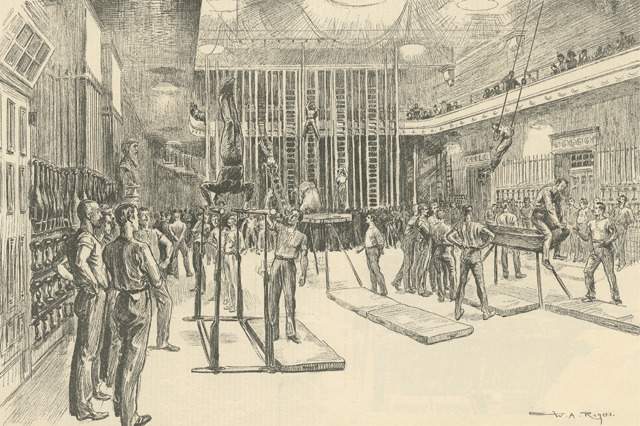 On February 16, 1888 the Wholesale Butchers gave their 4th annual ball at Teutonia Hall. Again attire was described. Diamonds flashed, men were dressed in black broadcloth, ladies in silks and satins. Black satin was again the preferred color and material. The dresses were trimmed with jet and pearls. Many of the ladies wore corsages of fresh flowers such as violets, roses, and lilly of the valley. One young lady's dress was trimmed with swan's down. Most of the ladies listed from both balls were unmarried. See Louis S Goldstein in Lower East Side Notables Mr. Goldstein advertised the rental of "Full Dress Suits". *Long "opera" or full length cloves that reached to or above the elbow. 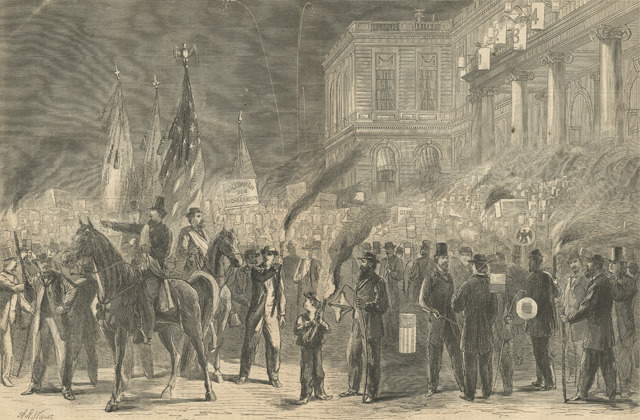 The celebration occurred in New York City on April 10, 1871. This event celebrated the end of the Franco-Prussian War (19 July 1870-10 May 1871. The Germany victory resulted in the unification of Germany under Kaiser Wilhelm I (William the Great). It also resulted in the end of the Second French Empire under Napoleon III (a nephew of Napoleon Bonaparte). This image is a composite of venues in the city. Notice the row of buildings on the top left corner. The second building has the word Helmbold across the top. Helmbold's Pharmacy was on Broadway near the corner of Prince. The center of the image represents Tompkin's Square. St Bridget's Church is visible to the right of the grand stand. Tens of thousands of people participated in the celebration. 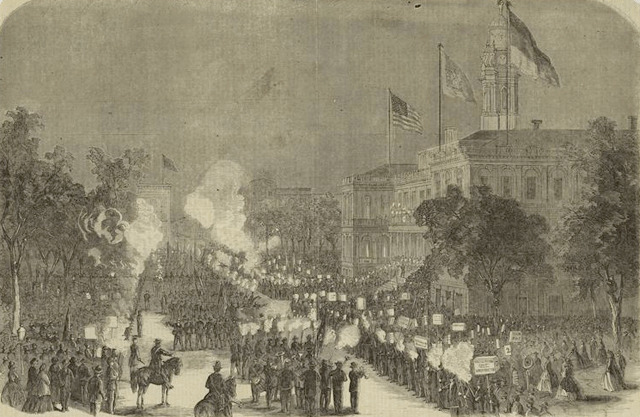 A "procession" lasting 3 and three quarters hours passed in front of City Hall and ended at Tompkins Square Park. Stores and buildings along the route were decorated with: banners, flags, streamers, bunting, drapery, flowers, fresh evergreens, 10 foot paintings, triumphal arches, etc. Every German club and society in the city marched in the procession. It is intersting that the top hat float is featured in both these images of the Peace Festival. I tried but could not find any mention of it in the press. 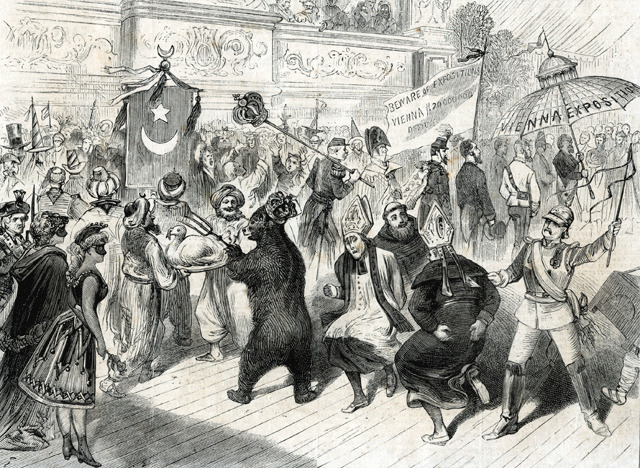 The Bavarian residents of the city celebrated their 10th annual festival in August 1883. About 250 members of the Bavarian society assembled at their headquarters at 139 Essex street. Major George W. Sauer led a procession, which included a company of Bavarian infantry and members of the Bavarian Society, from Essex street to Second street and First ave. then on to Second ave. where they boarded cars to the Sutzen Harlem River Park at the Harlem River above 125th street. At the park booth had been set up to sell lager, sausage, pigs feed and brown bread. By 2 o'clock about 2,000 people had assembled. The festivities began in ernest with a gun salute. The revelers entertained themselves with speeches, tableaus, aerobics, marching and dancing. The festivities went on for several days. The area between Houston and tenth streets and ave B and 1st street was said to be a Bavarian enclave. Epiphany, celebrated on January 6th, is the 12th day of Christmas also know as Twelfth Night. It is the day the Magi (the three wise men or kings) brought gifts to the Christ Child. Many people knows the song The Twelve Days of Christmas" but few still celebrate Epiphany anymore. Growing up we never took the Christmas tree and other decorations down until the day after Epiphany. Carnival is the season leading up Easter. Is some areas it start as early as January 6th (twelfth night). Traditions vary depending on the region of Germany but usually involved costumes, singing, parades, masked balls and drinking. The English word Easter derives from the German word Oster after a German goddess of the dawn. The Easter Hare brings colored eggs and candy in his basket. Colored eggs were placed in the garden for children to find. The children were told a hare had laid the eggs. 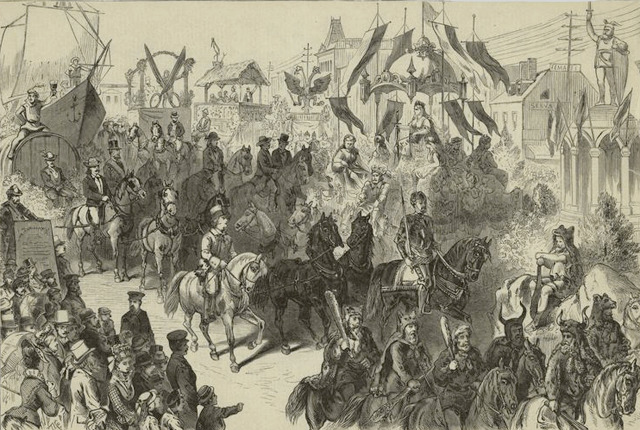 In 1860 "the recurrence of the German May festivals was hailed ... with unusual enthusiasm." On a pleasant day after some violent rains, the German population of New York city headed to the suburbs to picnic. There was the usual parade of glee clubs and vereins marching through the city, and then proceeding to Jones Woods by boat. In 1879 The New York Turn Verein celebrated the 29 anniversary of Pfingst-Montag picnic and carnival in Jones Woods. The athletic competition was fierce with gold metals awarded for first place and silver for second. The events included: high jump, running, shot put, 100 yard dash, dumb bell lifting, broad jump, and archery. 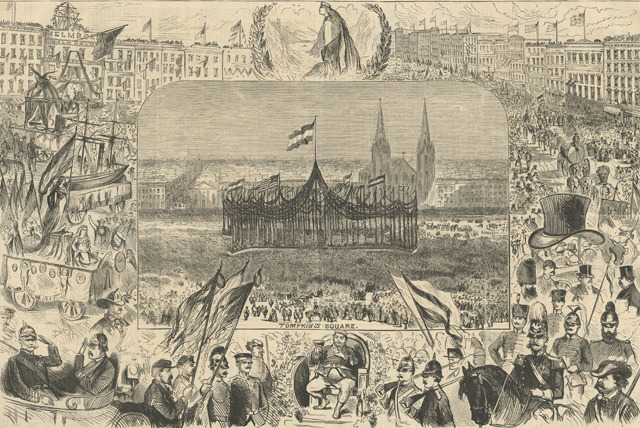 In 1887 Pfingst Montag and Decoration Day coincided and the "Teutonic residents of the city seized the opportunity to make the day a double celebration." The biggest gathering was at Jones Woods with music, dancing games and the customary festivities.. In 1881 every "son of Germany" felt duty bound to "leave his work and cares of the world behind and go out with his family or sweetheart into the green fields to great the Summer, and breathe the fresh, pure air of heaven." There were family, club and union picnics. Jones Woods was again the most popular destination. May pole dances were popular. 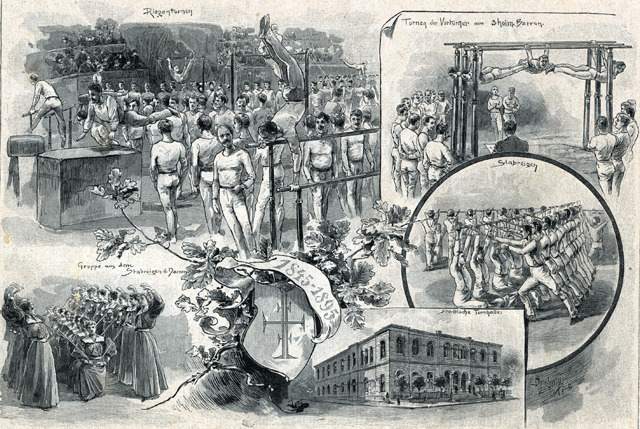 In September 1887 New York City Germans celebrated the 25th annual harvest festival of the Constatter Volksvest Verein at Sulzer's Park, 126th Street and 2nd Ave. Eating, drinking, singing, speeches, and dancing were part of the festivities. Mention was made of the "temperance cranks" and it was noted that "the peculiarities of a German celebration are the presence of good nature and the absence of the element who are prone to turn a picnic into a battlefield". Information from the New York Times, September 19, 1887. Sulzer's Park an amusement park containing two dance pavilions, merry go round, shooting gallery, swings, bowling and other attractions, was almost entirely destroyed by fire in November 1907. In October the German American community celebrated wine and beer festivals. Traubenfest celebrates the grape harvest. Michaelmas is the feast of St. Michael the archangel in September 29. Michael is the the head angel. His feast is a harvest festival day. Fairs were held a Michaelmas. There were also processions with the participants carrying bouquets of Michaelmas asters. The traditional dish was goose. By 1861 German immigrates had embraced Thanksgiving. The had garland dances, public and private parties and attended balls. The midday meal included a combination of American and German dishes. In the evening everyone went to the beer halls to sing and dance and watch gymnastic exhibitions. A big holiday celebration for Germans is/was from early December until early January. The season officially starts on the forth Sunday before Christmas with the beginning of Advent. An important part of the lead-up is the Feast of St. Nicholas on December 6th. The weeks to Christmas are counted on an Advent wreath. A wreath of evergreens is decorated with candles. One candle is lit the first Sunday. Two candles are lit on the second Sunday and so forth until Christmas. Christmas markets start around the feast of St. Nichols which is December 6. Festivities continue to the feast of the Magi (or Wise Men) on January 6th, the 12th day of Christmas, also known as Epiphany. It is traditionally the day the Magi appeared to pay honor to the Christ Child and bring him gifts of gold, frankincense and myrrh. German tradition introduced into the US also include the Christmas tree, the Christmas pyramid and elaborate wooden nutcrackers. On New Years Even costume balls were popular. In 1863 balls were given in all the German meeting halls on New Year's Eve. Entertainment included operas, plays, and concerts followed by midnight dinner featuring German specialities, after dinner balls. Food was free - drinks were paid for. There were "patriotic transparencies, cannon salutes and fire works." Patriotic transparencies were images constructed of translucent paper, painted (usually with water colors) and then covered with varnish. They depicted important people or national events in simple bold designs. A candle was placed behind the transparency to give what may have been a stained glass effect. They were a fire hazard. A Verein was/is a club. As mentioned, the German American community joined all sorts of clubs: shooting, social, political, regional and athletic. Unterstutzung verienes (support clubs) and Landsmannscraft (compatriots association) were sick or death benefit societies often organized by city or region of origin in Germany or by common occupation. One paid a small regular fee and received benefits when sickness or a death occurred. These societies often had joint burial plots in cemeteries. Volkfest vereins were organized by territory of origin and held festivals that promoted regional pride. Geographically related groups of immigrants celebrated the dialect, customs and cultures of their homeland in Germany. Clubs were organized to honor poets, composers, political and other events. Some clubs focused on singing, shooting, bowling or other sports and activities. National guard companies were popular. The Turn vereins focused on gymnastics with was an outgrowth of the physical culture movement of Napoleonic Germany. Masonic lodges were popular - although forbidden by the Catholic church. Members were mostly from the better off classes as fees were high. The New York Turn Verein was founded 1850. In 1890 the Turner Bund of New York had 1,800 members and was the largest in the United States. Note: The Know Nothing movement was an anti immigrant movement in the 1840s and 50s that was driven by fears that the country was being overwhelmed by German and Irish immigrants who did not uphold Anglo-Saxon values. Turn Vereins were popular wherever there were Germans. This image is of a Turn Verein in Liepzig, Germany. A Fair was held at the 37th Regiment on Broadway between 35th and 36th streets to raise money for wounded German soldiers. One of the chief attraction was the "magnificent Floral Temple". Adam Woodward suggested this might have been one of the servers in the Atlantic Gardens in the 1890s. "Gotham's greatest attraction!...... Open Every Day and Evening from (A.M.....The models in this Institution are directly from Nature and illustrate the Human Anatomy in such a faithful manner that admission can be granted ONLY TO MEN"
After a police raid in 1888 the museum was closed for four years. I was under various ownerships and at various locations from it founding in 1862. Kahns was associated with the Jordan family who had similar establishments in Boston, Philadelphia and San Francisco. Ostensibly, museums of this type were established to teach the general public about human anatomy in order to improve health and prevent disease. On display were wax models and specimens in jars. When several of these establishments were raided in 1888 the material confiscated by the police was described as "obscene, lewd, lascivious, filthy, indecent" and the head line as "REVOLTING SHOWS CLOSED".